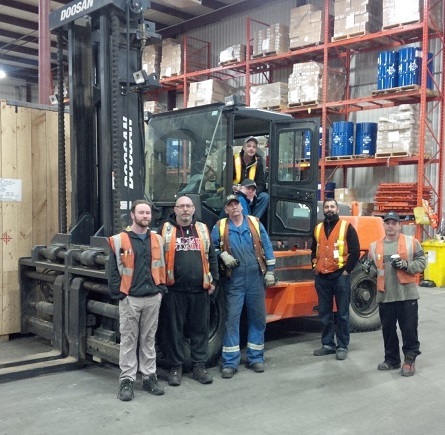 Landtran Logistics Inc.'s Edmonton warehouse has taken a large leap forward with the purchase of a heavy capacity forklift in the belief that we should be able to handle more of our customer's needs. This rugged machine has a 32,000 lb capacity and a compact frame to fit through smaller spaces than most large forklifts. With this purchase Landtran Logistics Inc. will be able to better serve our customers with their requirements for heavy lifting including crossdocking, warehousing, or destuff of large items. This purchase comes two years after Landtran Logistics Inc.'s warehouse expansion to over 170,000 sq. ft. in Edmonton. The combination of additional warehouse space and a higher lifting capacity has everyone at Landtran Logistics Inc. excited about our ability to serve a larger variety of our current and future customer's needs.